Women Empowerment has been one of our top agenda towards serving the society. Initiatives are taken time to time to ensure we are continuously working towards this goal. Some of our key initiatives include women skilling center, stitching and design center and jewellery designing initiative. Read on to know details. We set up our first women skilling center with beauty parlor course for women at Harola in 2015. Since then we have been many other centers with the help of our dedicated staff and partners. Such initiatives are praised by locals and we get lot of support from them. Stitching and design center helps women to be self dependent and become an earning member of their family while staying at their home. 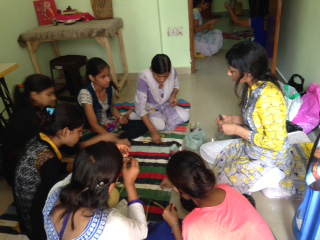 Under this initiative Niveda Foundation ensures that under privileged women and young girls learn the art of stitching and other related jobs. First such center was inaugurated at GD colony, Mayur Vihar Phase III in 2016. The center was inaugurated by DM of Gautam Budh Nagar, Mr.NP Singh. Thanks to Navrathan Foundation for partnering with Niveda Foundation in this project of empowering and training the underprivileged girls and women. Jewellery designing initiative was to help poor women by teaching them about artificial jewellery making. Niveda Foundation started Jewellery designing unit under the leadership of Rashmi Agarwal (professional & passionate designer) who is also part of Niveda Foundation youth team. Under this section we teach women how to make earrings, artificial jewelry and neck pieces. Under this initiative we provide training about fashion trends and make up. Girls take up this course to make their career in this domain. This helps them become independent via starting their own business or take freelance jobs to start earning for self and family.